Are you at a higher risk of developing carpal tunnel syndrome ? Have you ever suffered arthritis? Do you have high blood pressure or diabetes? Is your job involved repetitive wrist movement, include manufacturing, assembly line work, keyboarding occupations, and construction work? In this article we will talk about causes and treatments of carpal tunnel syndrome. Carpal tunnel syndrome is numbness, tingling, weakness, and other problems in your thumb and first three fingers of your hand because of pressure on the median nerve in your wrist. The median nerve and several tendons run from your forearm to your hand through a small space in your wrist called the carpal tunnel. The median nerve controls movement and feeling in your thumb and first three fingers (not your little finger). The goal of treatment for carpal tunnel syndrome is to allow you to return to your normal function and activities and to prevent nerve damage and loss of muscle strength in your fingers and hand. Treatment options for carpal tunnel syndrome include: home treatment, exercise, medication and surgery, depends on how severe your pain and symptoms are and if there is weakness. Rest your fingers, hand, and wrist. Stop activities that you think may be causing numbness and pain. 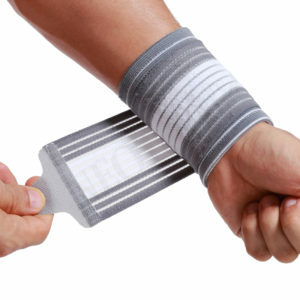 Use an ice pack to ice your wrist for 10 to 15 minutes at a time, once or twice an hour. Wear a wrist brace at night to keep your wrist in a neutral position and relieve pressure on your median nerve. When your pain is gone, ask your doctor information about exercises for building flexibility and strength in your hand, wrist, and arm. Rotating your wrist up, down, and from side to side. Stretching your fingers far apart, then relaxing them, then stretching them again. Stretching your thumb by pulling it back gently, holding it, and then releasing it. Wrist curls and extensions with a light weight. If any exercise or motion causes pain or swelling, stop that exercise, or reduce the intensity or amount of motion. Nonsteroidal anti-inflammatory drugs (NSAIDs) may relieve pain and inflammation and are available with or without a prescription. Surgery is sometimes recommended when other treatment hasn’t helped, if you’ve had carpal tunnel syndrome for a long time, or if there is nerve damage or the risk of nerve damage. Wear a wrist brace when you cannot control your wrist motion, such as while sleeping. A brace can keep your wrist in a neutral position-that is, not bent too far forward or back-and reduce the stress on your fingers, hand, or wrist. In daily routines at home or while doing hobbies, think about changing activities in which you make repeated finger, hand, or wrist movements. Train yourself to use other positions or techniques that won’t stress your hand or wrist. loved it ! Keep up the good work ! Hi, thank you for stopping by, I’m so glad that you like our post! We will talk more about back pain, joint health and exercises to keep healthy in the future. You can also find us on Facebook(https://www.facebook.com/steadyjoints/) and Twitter(https://twitter.com/steadyjoints) for more tips! A person essentially help to make seriously articles I would state. This is the very first time I frequented your website page and thus far? I surprised with the research you made to create this particular publish incredible. Fantastic job! Hi, thank you for stopping by and your comment! We always double check our posts before posting, so maybe it is not a format issue. Sometimes change a browser would be help. We will talk more about back pain, joint health and exercises to keep healthy in the future. You can also find us on Facebook(https://www.facebook.com/steadyjoints/) and Twitter(https://twitter.com/steadyjoints) for more tips!